Eftersommar (Late Summer) an early naturalistic work, painted by af Klint in 1903. An example of the works she exhibited to the public during her lifetime. 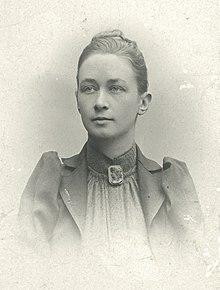 The fourth child of Captain Victor af Klint, a Swedish naval commander, and Mathilda af Klint (née Sonntag), Hilma af Klint spent summers with her family at their manor Hanmora on the island of Adelsö in Lake Mälaren. In these idyllic surroundings Hilma came into contact with nature at an early stage in her life; and this deep association with natural forms was to be an inspiration in her work. Later in life, Hilma af Klint came to live on a permanent basis at Munsö, an island next to Adelsö. From her family, Hilma af Klint inherited a great interest for mathematics and botany. She showed an early ability in visual art, and after the family moved to Stockholm, she studied at the Academy of Fine Arts of Stockholm (Konstakademien), where she learned portraiture and landscape painting. She was admitted at the Royal Academy of Fine Arts at the age of twenty. During the years 1882–1887 she studied mainly drawing, and portrait- and landscape painting. She graduated with honors, and was allocated a scholarship in the form of a studio in the so-called "Atelier Building" (Ateljébyggnaden), owned by The Academy of Fine Arts in the crossing between Hamngatan and Kungsträdgården in central Stockholm. This was the main cultural hub in the Swedish capital at that time. The same building also held Blanch's Café and Blanchs Art Gallery, where the conflict stood between the conventional art view of the Academy of Fine Arts, and the opposition movement of the "Art Society" (Konstnärsförbundet), inspired by the French En Plein Air painters. Hilma af Klint began working in Stockholm, gaining recognition for her landscapes, botanical drawings, and portraits. Her conventional painting became the source of financial income. But her 'life's work' remained a quite separate practice. In 1880 her younger sister Hermina died, and it was at this time that the spiritual dimension of her life began to develop. Her interest in abstraction and symbolism came from Hilma af Klint's involvement in spiritism, very much in vogue at the end of the 19th and beginning of the 20th century. Hilma af Klint became interested in the Theosophy of Madame Blavatsky and the philosophy of Christian Rosencreutz. In 1908 she met Rudolf Steiner, the founder of the Anthroposophical Society, who was on a visit to Stockholm. Steiner initiated her in his own theories regarding the Arts, and would have a certain influence on her paintings later in life. Several years later, in 1920, she met him again at the Goetheanum in Dornach, Switzerland, the headquarters of the Anthroposophical Society. Between 1921 and 1930 she spent long periods at the Goetheanum. Af Klint's work can be understood in the wider context of the Modernist search for new forms in artistic, spiritual, political and scientific systems at the beginning of the 20th century. One will find the same interest in spirituality in other artists during this same period, such as Wassily Kandinsky, Piet Mondrian, Kasimir Malevitch and the French Nabis of which many were, like af Klint, inspired by the Theosophical Movement. However, the artistic transition to abstract art and the nonfigurative painting of Hilma af Klint would occur without any contacts with the contemporary modern movements. The works of Hilma af Klint are mainly spiritual, and her artistic work is a consequence of this. At the Academy of Fine Arts she met Anna Cassel, the first of the four women with whom she later worked in "The Five" (de Fem), a group of artists who shared her ideas. The group of female artists The Five was engaged in the paranormal and regularly organized spiritistic séances. They recorded in a book a completely new system of mystical thoughts in the form of messages from higher spirits, called The High Masters ("Höga Mästare"). One, Gregor, spoke thus: "All the knowledge that is not of the senses, not of the intellect, not of the heart but is the property that exclusively belongs to the deepest aspect of your being...the knowledge of your spirit". The pictures were painted directly through me, without any preliminary drawings, and with great force. I had no idea what the paintings were supposed to depict; nevertheless I worked swiftly and surely, without changing a single brush stroke. In 1906, after 20 years of artistic works, and at the age of 44, Hilma af Klint painted her first series of abstract paintings. Svanen (The Swan), No. 17, Group 9, Series SUW, October 1914 – March 1915. This work was never exhibited during af Klint's lifetime. The work for the Temple ran between 1906 and 1915, carried out in two phases with an interruption between 1908 and 1912. As Hilma af Klint discovered her new form of visual expression, she developed a new artistic language. Her painting became more autonomous and more intentional. The spiritual would however continue being the main source of creativity throughout the rest of her life. The collection for the Temple counts in total 193 paintings, grouped in several sub-series. The major paintings, dated 1907, are extremely large in size : each painting measures approximately 240 x 320 cm. This series, called The Ten Largest, describes the different phases in life, from early childhood to old age. Quite apart from their diagrammatic purpose the paintings have a freshness and a modern aesthetic of tentative line and hastily captured image: a segmented circle, a helix bisected and divided into a spectrum of lightly painted colors. The artistic world of Hilma af Klint is impregnated with symbols, letters and words. The paintings often depict symmetrical dualities, or reciprocities : up and down, in and out, earthly and esoteric, male and female, good and evil. The colour choice is throughout metaphorical: blue stands for the female spirit, yellow for the male one, and pink / red for physical / spiritual love. The Swan and the Dove, names of two series of the Paintings for the Temple, are also symbolic, representing respectively transcendence and love. As gates to other dimensions, her paintings call for interpretation on a narrative, esoteric and artistic level. When Hilma af Klint had completed the works for the Temple, the spiritual guidance ended. However, she pursued abstract painting, now independently from any external influence. If the paintings for the Temple were mostly oil paintings, she now also used watercolors. Her later paintings are significantly smaller in size. She painted among others a series depicting the stand-points of different religions at various stages in history, as well as representations of the duality between the physical being and its equivalence on an esoteric level. As Hilma af Klint pursued her artistic and esoteric research, it is possible to perceive a certain inspiration from the artistic theories developed by the Anthroposophical Society from 1920 onward. Hilma af Klint died in 1944, nearly 82 years old, in the aftermath of a traffic accident. In her will, Hilma af Klint left all her abstract paintings to her nephew, a vice-admiral in the Swedish Royal Navy. She specified that her work should be kept secret for at least 20 years after her death. When the boxes were opened at the end of the 1960s, very few persons had knowledge of what would be revealed. In 1970 her paintings were offered as a gift to Moderna Museet in Stockholm, which declined the donation. Thanks to the art historian Åke Fant, her art was introduced to an international audience in the 1980s, when he presented her at a Nordik conference in Helsinki in 1984. 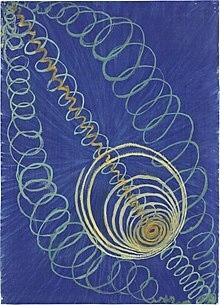 Erik af Klint then donated thousands of drawings and paintings to a foundation bearing the artist's name in the 1970s. The collection of abstract paintings of Hilma af Klint counts more than 1200 pieces. 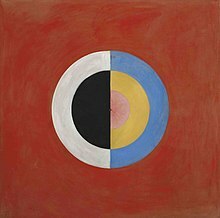 It is owned and managed by the Hilma af Klint Foundation in Stockholm, Sweden. In 2017, Norwegian architectural firm Snøhetta presented plans for an exhibition centre dedicated to af Klint in Järna, south of Stockholm, with estimated building costs of between €6 million and €7.5 million. In February 2018, the Foundation signed a long-term agreement of cooperation with the Moderna Museet, thereby confirming the perennity of the Hilma af Klint Room, i.e. a dedicated space at the museum where a dozen works of the artist are shown on a continuous basis. Hilma af Klint and her work are presented in the movie Personal Shopper, in which the main character researches art that is inspired by spirits. The art of Hilma af Klint inspired Acne Studios for the summer collection of 2014. The work of Hilma af Klint is cited by Jane Weaver as inspiration for her 2017 Modern Kosmology album. The abstract work of Hilma af Klint was shown for the first time at the exhibition "The Spiritual in Art, Abstract Painting 1890–1985" organized by Maurice Tuchman in Los Angeles in 1986. This exhibition was the starting point of her international recognition. Ockult målarinna och abstrakt pionjär, Moderna museet Stockholm, Sweden 1989–1991. Travelling exhibition : Göteborgs Konsthall, Gothenburg, Sweden ; Lunds Konsthall, Lund, Sweden ; Fyns Kunstmuseum, Denmark. Works by af Klint was exhibited at the Central Pavilion of the 55th Venice Biennial, Italy. June 1 – November 24, 2013. The Swan nr 16, Group 9, 1915. The Swan nr 18, Group 9, 1915. (in German) Okkultismus und Abstraktion, die Malerin Hilma af Klint, Åke Fant, Albertina, Wien 1992, ISBN 3-900656-17-7. Hilma af Klint, the Greatness of Things, John Hutchinson (Hrsg. ), Douglas Hyde Gallery, Dublin 2005. English text, 23 images. ISBN 0-907660-99-1. The Message. Art and Occultism. With an Essay by André Breton. Hrsg. v. Claudia Dichter, Hans Günter Golinski, Michael Krajewski, Susanne Zander. Kunstmuseum Bochum. Walther König: Köln 2007, ISBN 978-3-86560-342-5. ^ Cain, Abigail. "What Was the First Abstract Artwork?". Artsy.net. Retrieved 2017-03-31. ^ Voss, Julia. "The first abstract artist? (And it's not Kandinsky)". www.tate.org.uk. Tate Modern. Retrieved 22 May 2015. ^ Bashkoff, T., ed., et al., Hilma Af Klint (New York: Solomon R. Guggenheim Museum, 2018). ^ "Hilma af Klint: Painting the Unseen". Serpentine Galleries. Retrieved 2017-03-11. ^ Kellaway, Kate (2016-02-21). "Hilma af Klint: a painter possessed". The Guardian. ISSN 0261-3077. Retrieved 2017-03-11. ^ Witt, Karolina. "Hilma af Klint Tempelbilderna och historieskrivningen" (PDF). www.diva-portal.org. Halmstad University. Retrieved 4 Dec 2015. ^ Clemens Bomsdorf (April 13, 2017), Museum for pioneer of abstraction Hilma af Klint is stuck in limbo The Art Newspaper. ^ "Jane Weaver on the mystical inspiration for her space rock". The Independent. 2017-07-10. Retrieved 2018-01-15. ^ Smith, R., "'Hilma Who?' No More", The New York Times, Oct 11, 2018. Wikimedia Commons has media related to Hilma af Klint. Guggenheim Museum, Hilma af Klint, YouTube, 2018. This page was last edited on 7 April 2019, at 22:18 (UTC).